Here is an unusual situation that just happened to me: A woman contacted me about photographing an event on April 1st of this year - a memorial service for her late father. She wanted family groups photographed as well as some candid images of the people attending. Her language was very broken in the email saying things like; "Please let me know how convinent it would be for you in other to plan ahead..." Kind of weird, but not necessarily a red flag some people have a hard time communicating via email. As the event is drawing near - I sent her a note to have her call with a credit card, meet me at my studio or send me a payment to hold the date. This is when it got interesting. 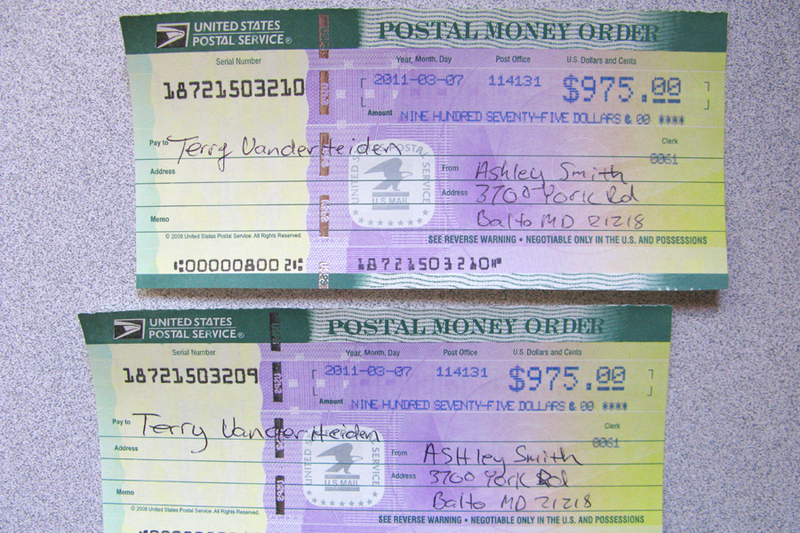 Today she sent me a FedEx Package that contained about $2000 in Postal Money Orders, (the deposit should have been $1600). The FedEx package came from a company in Illinois called General Control. Since most of my customers don't want to pay MORE than they need to, I thought this was a little fishy. However, since I didn't know for sure, I had to cover my bases so I didn't not show up to an event that people expected me at. I went back in my emails and found that the event was going to be at the Palm Event Center in Livermore. I gave them a call and found that nothing had been booked on April 1 for them. Red Flag. However, it would be possible that a different location was chosen and they didn't let me know yet. As they looked good with their sliver ink and multi colored paper, however the person who they were from, (Ashley S.) was neither my email contact or the person who sent the Fed Ex. Another Red Flag, so I went online to check and see if the Money Orders were indeed real. These Money Orders don't look anything like what I received (is this a big enough red flag?). 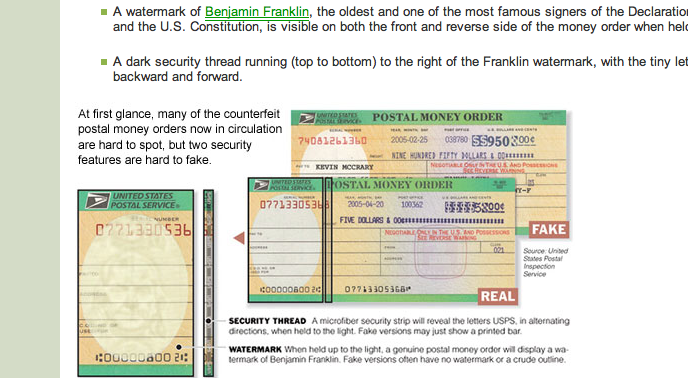 They should have a watermark of Ben Franklin on it as well as a multi-colored security thread running though the paper. Mine were way off. For confirmation, I called and finally got through to the United States Postal Service Inspectors to tell me if the serial numbers were infact invalid -they were. For even more follow up I called the company, General Control that was listed on the Fed Ex packet to see if I could talk to the person who sent me the Fed Ex. My thought was if it was some sort of scam - this woman is investing at least in a FedEx overnight package. Since the first name of the person sending me the Fed Ex packet was almost identical to my emailer, I figured why not call. I spoke to a person at their company to find out that their FedEx account number had been stolen and had been used to send out over 50 fake FedEx packages, mine was one of them. OK, I'm not an idiot, now I am sure it's a scam - but how do they get anything out of it. I doubted that there would be anyone at the shoot next Friday so how would they profit from this scam? It only took a few minutes to get the email hook. I sent them a note, saying I had received the Fed Ex and in it was MORE money than I had expected, I went on to say, shall I just credit them for more hours or add on prints to their order? I just contacted my associate and he said that he misunderstood me concerning the instruction I gave to him as regards the amount he was supposed to send to you . I am very sorry for this mistake. Actually he was supposed to send you $1000 as the first initial deposit and send the balance $950 to my touristguide in china. he has been waiting for the money so she can start making preparation for the booking of hotels of our guest who will be coming from china for this service . What I want you to do now is to take the money order to your Bank and deposit the payment in your account to get cash out, and just deduct money for the initial deposit as agreed and have the rest balance sent to him on the below information. You can deduct the western union fees from the balance and send the rest as instructed. I will balance you up after the conclusion of the service. Please transfer and send me the below information so that i can forward it to her to pick it up immediately. 1. Sender's Name 2. Reference NumberThanking you in anticipation of your favorable assistance.Await your urgent reply. It turns out, reporting this sort of thing is a hassle all onto itself. After spending quite a bit of time on-line and on telephone-voice-prompt-hell, the US Postal Inspectors were pretty useless. One representive suggested I try to deposit the money orders at the bank, what? The group that did respond was my Alameda County Sheriff's Department - they took a report, my email conversations with the scammer, and they took bogus money orders with them. Hopefully that is the end of it. So needless to say I'm not shooting their event on April 1, (April Fools Day) after all.